We are Czech manufacturer which is engaged in manufacturing high quality wooden toys and decorations with innovative design. All toys are manufactured in accordance with European standards using certified materials and paints. 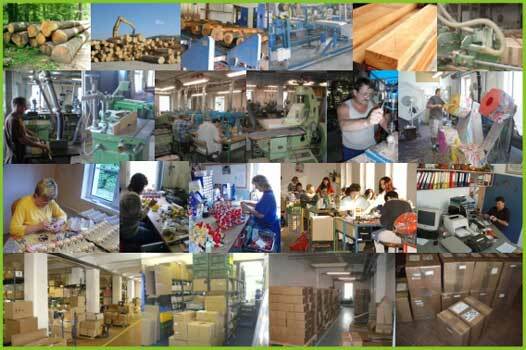 Our production of wooden toys and decorations started in 1991. We are continuing the rich tradition which has been developing in Bohemia over the last two centuries. We began as a small family workshop, producing for the home market which slowly expanded over time as a result of customer demand and satisfaction with the quality of our products, so our little family business grew into a company with a comprehensive production programme with export into many countries all over the world. Currently we produce more than 950 varieties of products and still continue to develop new designs. We employ about 60 people in two production halls and several tens of craftsman who work for us from their home workshops. All the production takes place in the Czech Republic and we ensure good working conditions for all our employees. Our flexible external staff make our production possibilities also very open and flexible. We are able to raise and lower the capacity of the production dependant upon the volume of market demand at any moment. Apart from our standard yet evolving range of products, we also offer tailor-made commissions based on our customer’s specific requirements. When developing a new design we put emphasis on originality and utility value. In the production we concentrate on high quality and safety of the products.